The material a patio table is made from determines much more than just how the table looks. Different materials offer unique levels of durability and weather-resistance. 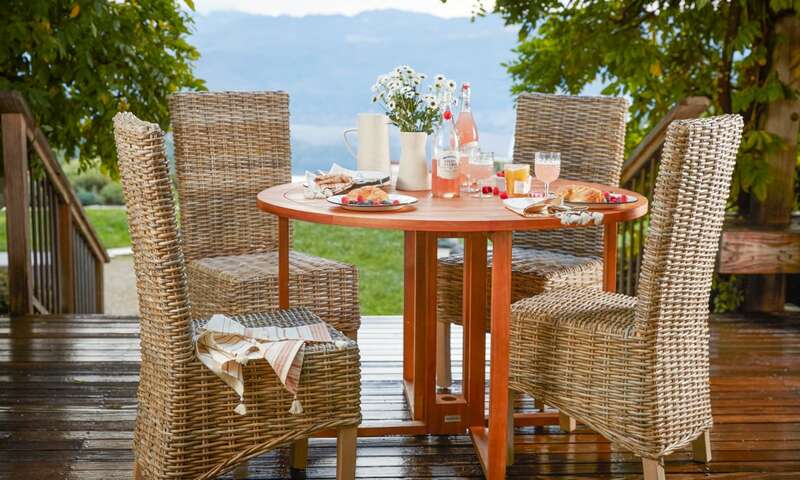 Below, we have outlined the key benefits and drawbacks of common patio table materials. Wood patio tables are sturdy and traditional. If you’re going for a classy yet casual look, get a wooden table, but make sure it is stained or sealed to handle wet weather. Otherwise, the wood will start to rot after prolonged exposure. Metal patio tables are typically very formal, and they are some of your most durable options. They are also heavier than other types of tables, making them ideal for windy locations. Keep in mind that certain metals, like iron, will rust over time if they don’t feature a weather-proof coating. Plastic or PVC patio tables are lightweight, low maintenance, and easy on your budget, but they can mildew in wet climates. 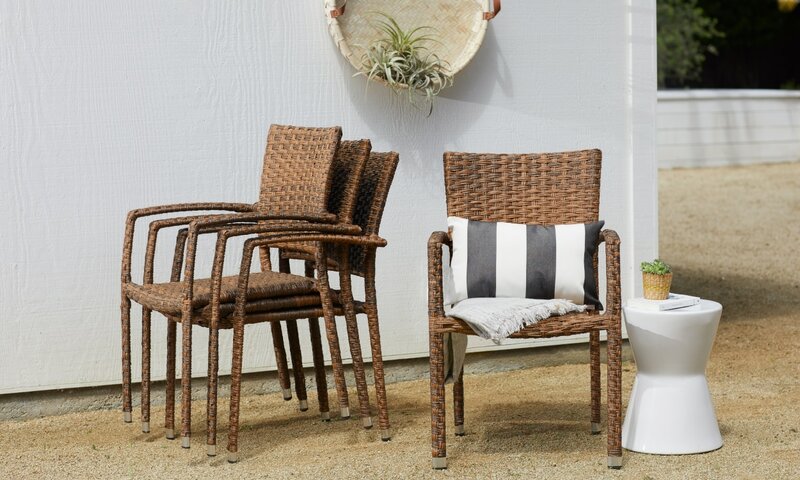 Wicker or rattan patio tables are the epitome of casual and go well with cottage decor styles. Like plastic and PVC, wicker can also mildew. 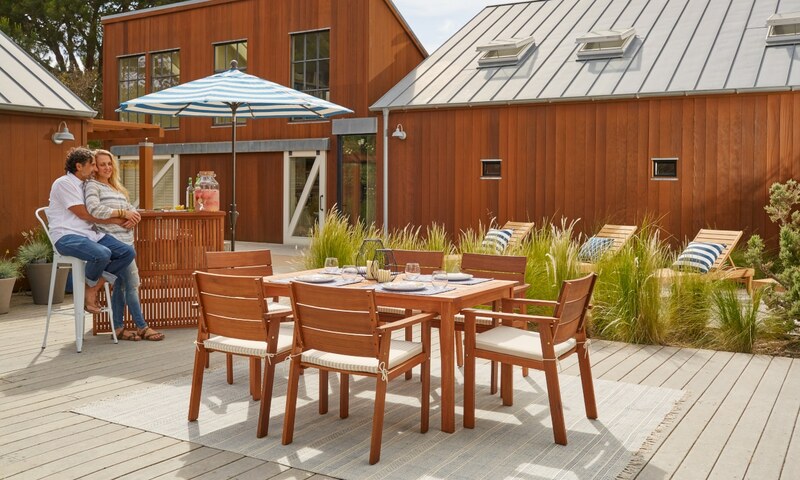 When choosing a patio table, make sure you get one that is suited to your climate. Even if the table is more expensive initially, you will save money in the end by not having to replace it every summer. With a friend, carefully measure the length and width of your patio. The ideal table will leave plenty of room for chairs and traffic all around it. We recommend you have about three feet of clearance on all sides of a table. For example, if your patio is 12 feet long by 8 feet wide, you’ll want a table that measures close to 6 feet long by 2 feet wide. 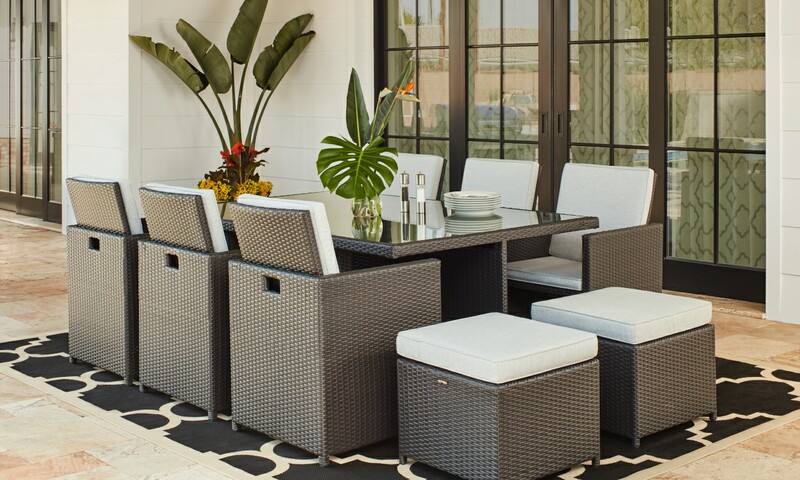 If you want to leave room on your patio for other furnishings, scale down the size of your table to make sure each piece of furniture has around three feet of clearance. In addition to size, you should consider which shape is best for your space. Round and square tables make a patio feel more casual, and they take up less space than rectangular tables. Bistro tables, cafe tables, and bar tables are even smaller, making them perfect for two-person lunches on small patios and balconies. Rectangular and oval patio tables require larger patios, but they can usually seat a lot more people. For summer parties and outdoor dining, get a table that can seat your family plus some guests. A good rule of thumb is to provide each person with 18 to 24 inches of space plus 6 to 12 inches between place settings. A square table that measures 40 inches on each side can comfortably seat four people, as can a round table with a diameter of 44 inches. Rectangular tables that measure 56 inches long can seat six, while those that measure 70 inches long can seat eight. If you need something even larger for your summer get-togethers, tables that seat up to 16 people are also available. Follow these same dimensions if you plan to use the table for games, craft projects, or any other activities besides dining. Many patio tables are sold in sets that include matching chairs, but if you want to hand-pick comfortable seating or go for a more diverse aesthetic, you can purchase your table and chairs separately. Outdoor chairs can be made of all the same materials as outdoor tables. For optimal comfort, choose chairs that feature weather-resistant cushions. You should also make sure that the chairs are sized correctly for your table. Patio tables are typically about 30 inches high (standard dining height), so chairs with seats around 18 inches off the ground work for most patio tables. If you plan to use your patio table in daylight a lot, consider investing in a patio umbrella for shade. Many patio tables are built with holes drilled into their tops to hold umbrellas. 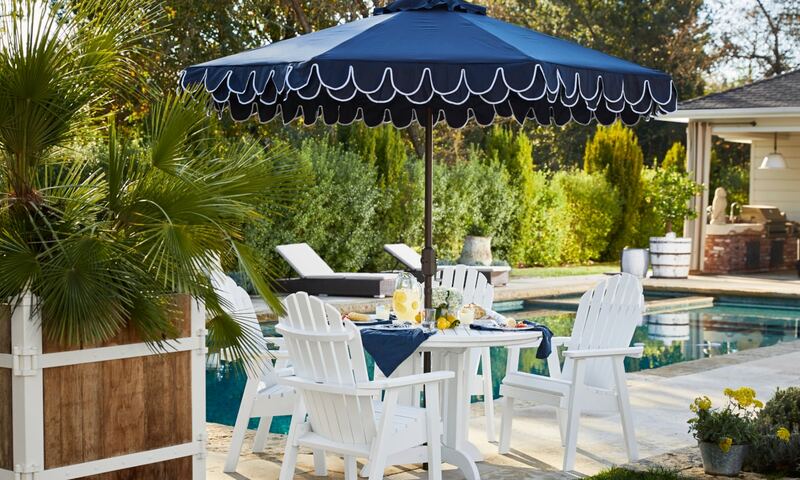 When selecting an umbrella, choose one with a canopy wide enough to shade your entire table. You’ll also want to make sure your umbrella is made with a weather-resistant fabric. If you would like some help choosing an umbrella, check out our Patio Umbrella Buying Guide. 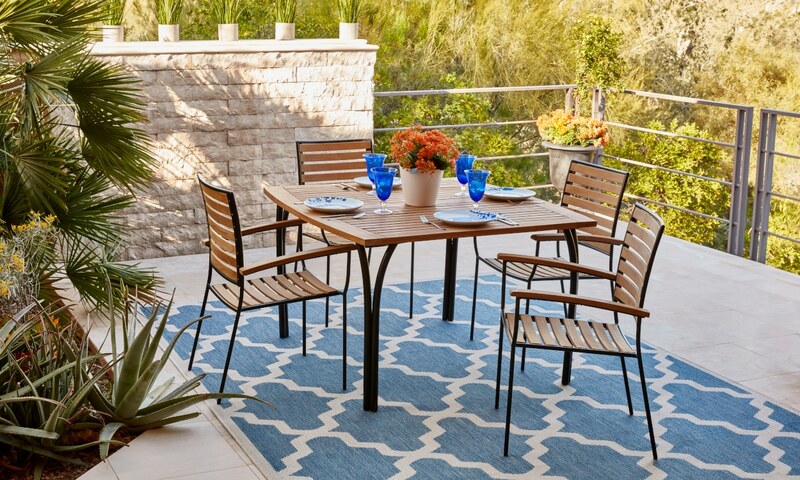 The right table is a crucial part of any homey and practical patio. Now you’re ready to make an informed decision and get a table that is perfect for you, your guests, and your patio.